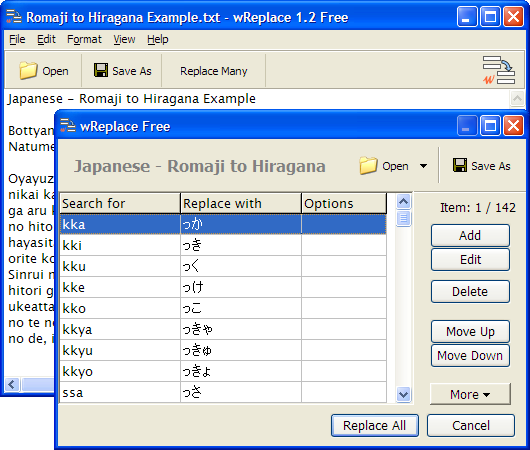 Export and import whole replacement table. Changing one set of characters into another. Useful for making HTML pages when you deal with different coding defined with <meta http-equiv="content-type" ... > tag. Simple substitution cipher (e.g. ROT13, ROT47). Russian; Cyrillic, conversion into Latin phonetic transcription ISO 9-1995.
string replace, search and replace, find and replace, search replace, find replace, replace text, multi replace, multiple replace, replace characters, text converter, convert text, Morse code, Unicode, rot13, rot47, transcription, transliteration, romanization, phonetics, diacritic, diacritical, diacritics. Described apps: TriX, Transfz, wReplace and PhraseExpress.